Go to original pattern for design DROPS 180-31. 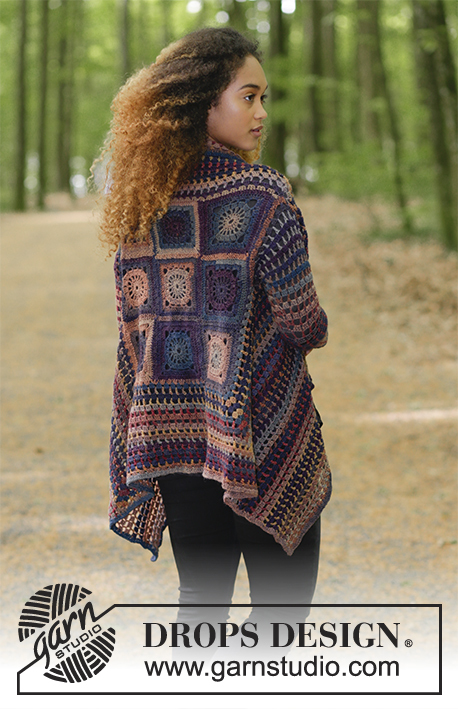 Jacket with crochet squares in the back, worked in the round from the back. 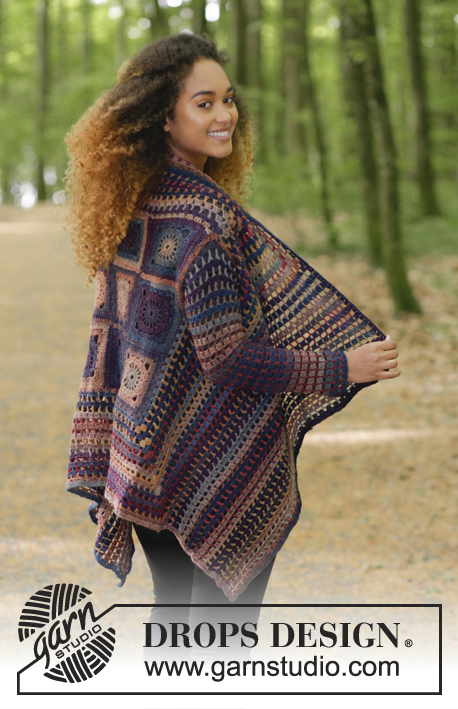 Size: S - XXXL Piece is crocheted in DROPS Delight. DROPS CROCHET Hook size 4 mm / G/6 - or size needed to get 22 double crochets x 12 rows = 10 cm / 4'' in width and 10 cm / 4'' vertically. 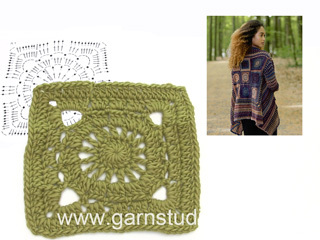 1 crochet square measures approx. 12 x 12 cm / 4¾''. 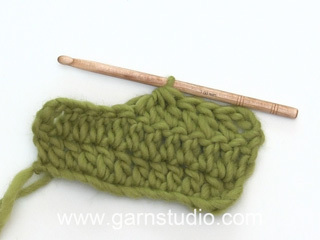 Work 1 round/row with fall forest (applies to rounds/rows with 3 double crochets + 1 chain stitch in diagram A.2-A.6). 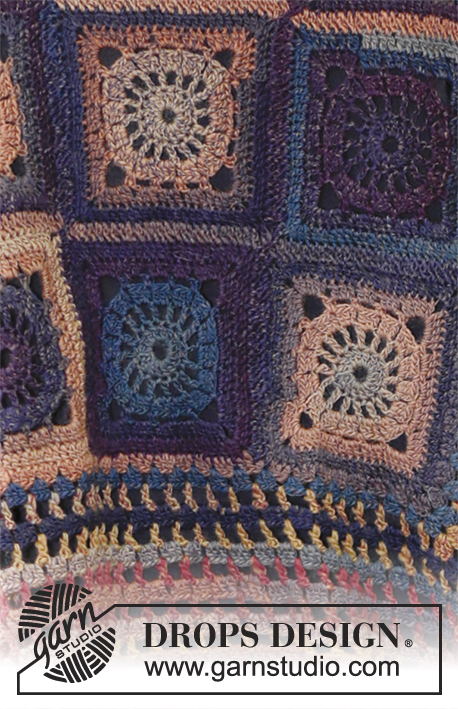 Work 1 round/row with raspberry cake (applies to rounds/rows with 3 chain stitches + 1 double crochet in diagram A.2-A.6). Repeat these 2 rounds/rows the rest of piece. To make the color transitions in Delight pretty when switching ball, it is important to find a ball that starts with the same color last ball ended with. Work 9 crochet squares before sewing them together into a square back piece. Then work around this square and skip stitches for armholes. Then work back and forth for front pieces. Finish by working the sleeves in the round. Work 6 chain stitches on hook size 4 mm / G/6 with fall forest and form a ring with 1 slip stitch in first chain stitch. 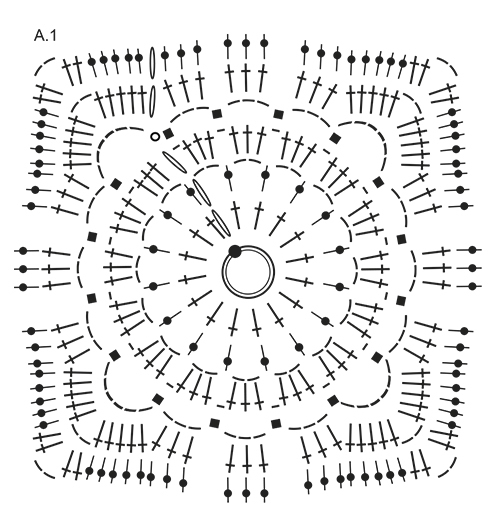 Then work PATTERN in the round according to diagram A.1. REMEMBER THE CROCHET GAUGE! 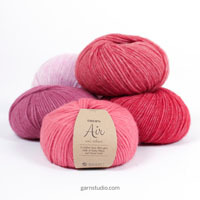 Read TIP FOR CHANGING YARN! 1 crochet square should measure 12 x 12 cm / 4 3/4" x 4¾''. Work 9 crochet squares in total. Place the squares with 3 squares in width and 3 squares in height. Place 2 squares together wrong side against wrong side and work together from right side: * 1 single crochet in corner of first square, 1 chain stitch, 1 single crochet in corner of next square, 1 chain stitch, 1 single crochet in next stitch on first square, 1 chain stitch, 1 single crochet in next stitch on second square, 1 chain stitch, 1 single crochet in next stitch on first square, 1 chain stitch, 1 single crochet in next stitch on second square *, work from *-* but in transitions between each set of squares work 1 chain stitch. Work the all the squares together in this way. NOTE! Make sure that the transitions between every square are pretty when the squares are worked together alongside. Fasten off. NOTE! Insert 1 marker thread in outer row in piece, NOW MEASURE PIECE FROM HERE. Then work 1 round with double crochets around the entire square as follows - start at the top in the right corner (= 1st corner = see chart). ROUND 1: Work A.2a around chain space in corner, A.2b over the next 3 double crochets, A.2c until 6 double crochets remain before next corner, A.2d over the next 6 double crochets, A.2a around chain space in next corner. Work 42 loose chain stitches and skip 42 double crochets (= armhole), work A.2c over the next 27 double crochets, A.2d, A.2a around chain space in corner, A.2b, A.2c until 6 double crochets remain before next corner, A.2d, A.2a around chain space in corner, A.2b, A.2c over the next 27 double crochets, work 42 loose chain stitches (= armhole), skip 42 double crochets, finish round with 1 slip stitch in 3rd chain stitch at beginning of round. ROUND 2: Work next round in diagrams the same way, but work 14 repetitions A.2c around chain stitch row for armhole in each side. 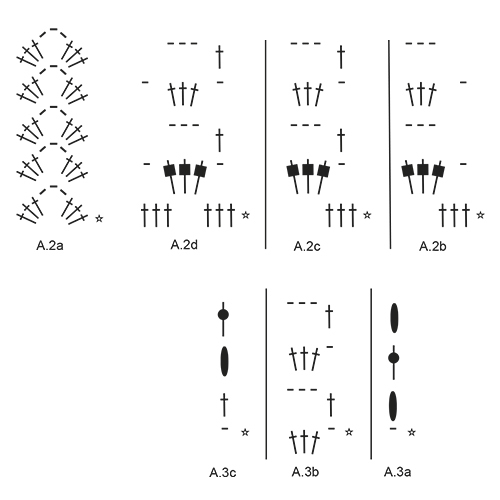 There are now room for 24 repetitions A.2c + A.2b and A.2d, along each side of square, and A.2a in each corner. 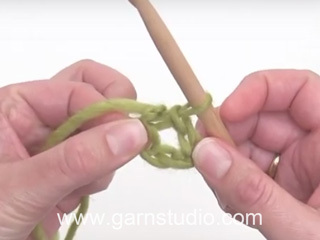 Continue until diagrams have been worked vertically, then repeat the last 2 rounds in diagram A.2a, A.2b, A.2c and A.2d until piece measures 20 cm / 8'' – finish after a repetition with 3 double crochets + 1 chain stitch! Cut the yarn. Then work FRONT PIECE - see explanation below. * Work A.2a around chain space in corner, A.2b over the next 3 double crochets, A.2c until 6 double crochets remain before next corner, A.2d over the next 6 double crochets *, work from *-* for the rest of the round. When 2 rounds have been worked, size L and XL are done. When 4 rounds have been worked, size XXL and XXXL are done. ROUND 1:	Work A.2a around chain space in 1st corner, A.2b, A.2c until 6 double crochets before next corner, A.2d, A.2a around chain space in next corner. Work 45-45-48-51 loose chain stitches and skip 45-45-48-51 double crochets (= armhole), work A.2c over the next 36-36-45-42 double crochets, A.2d, A.2a around chain space in corner, A.2b, A.2c until 6 double crochets remain before next corner, A.2d, A.2a around chain space in corner, A.2b, A.2c over the next 36-36-45-42 double crochets, work 45-45-48-51 loose chain stitches, skip 45-45-48-51 double crochets (= armhole), finish round with 1 slip stitch in 3rd chain stitch at beginning of round. ROUND 2: Work next round in diagrams the same way, but work 15-15-16-17 repetitions A.2c around chain stitch row for armhole in each side. Continue by repeating the last 2 rounds in diagram A.2a, A.2b, A.2c and A.2d until piece measures 20 cm / 8'' – finish after a repetition with 3 double crochets + 1 chain stitch! Cut the yarn. Then work FRONT PIECE - see explanation below. Work front pieces back and forth seperatly. Continue stripes as before. 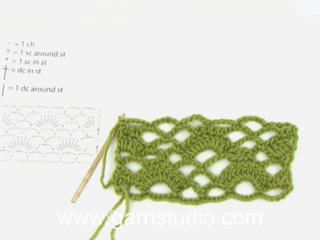 Begin from wrong side and fasten strand with 1 single crochet around chain space in 1st corner - see star on chart! Work A.3a around chain space (show how row begins and ends), A.3b until 4th corner, work A.3c around chain space in corner (shows how row begins and ends). Continue like this back and forth. 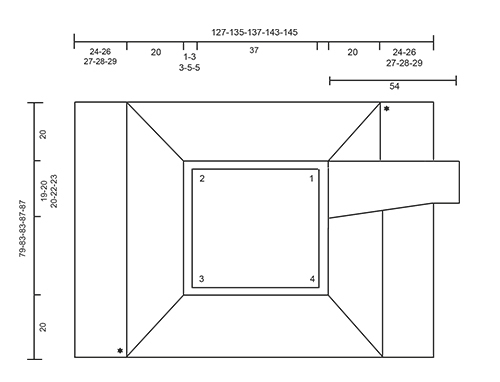 When diagrams have been worked vertically, repeat the 2 last rows in diagram until front piece measures 24-26-27-28-29 cm / 9½"-10 1/4"-10½"-11"-11½" - finish after a row as last row in diagrams! Fasten off. Repeat on the other side the same way but now work back and forth from 3rd to 2nd corner - see chart! 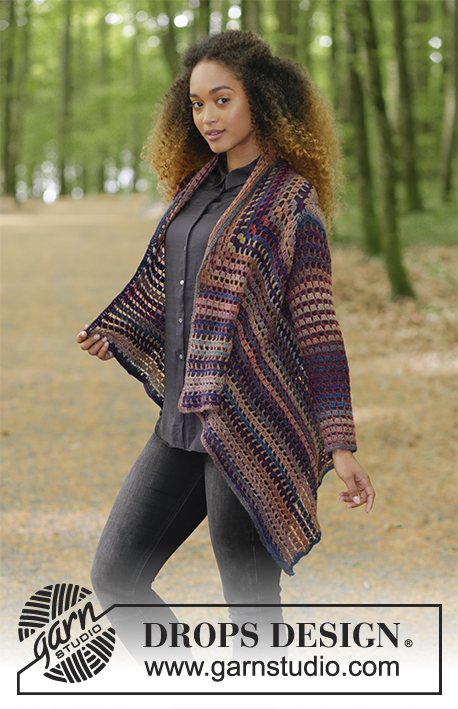 Finish with a round double crochet around entire jacket: Work 1 double crochet in every double crochet / 1 double crochet around every chain space (3 double crochets, 1 chain stitch, 3 double crochets), in the outermost double crochet in each of the four corners. Fasten off. Work sleeve in the round from armhole. Remember CROCHET INFORMATION! Insert a marker under armhole. NOW MEASURE PIECE FROM HERE! Beginning of round is here! 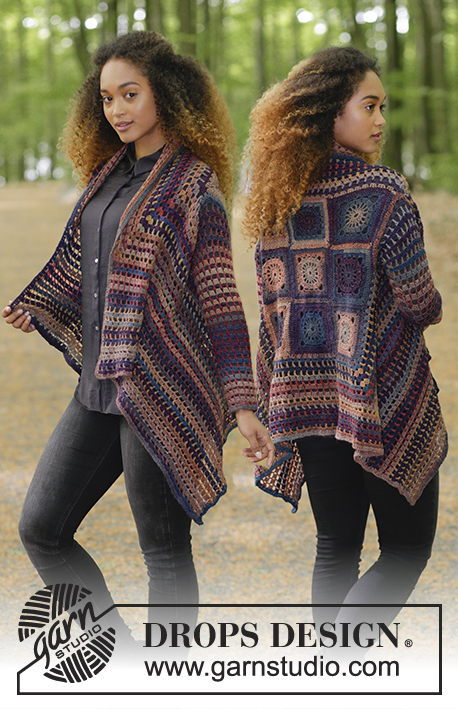 Begin by working 84-92-92-96-104 double crochets evenly around the opening for sleeve with raspberry cake. 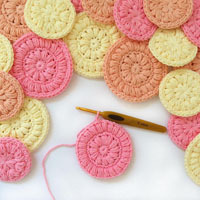 Continue in the round with stripes as before and pattern as follows: Work A.4 over the first 16 double crochets, work A.5 over the next 48-56-56-60-68 double crochets, work A.6 over the last 20 double crochets. Continue like this in the round. 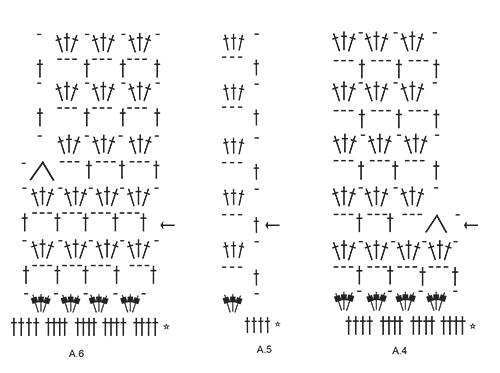 When diagrams have been worked vertically, 1 decrease has been done on each side of marker thread. Then repeat pattern from row marked with arrow in diagram 3-4-4-3-4 more times vertically (= 4-5-5-4-5 decreases on each side of marker thread). Continue with pattern the same way without decreasing until sleeve measures 54 cm / 21 1/4'' – finish after a round as last round in A.4-A.6. Fasten off. Work the other sleeve the same way. = this round/row has already been worked, begin on next round/row! Gefällt mir super! Schöne Herbstfarben! Så fin, den här vill jag absolut göra!